Prices are subject to change without notice, subject to State and Local Meals Tax, and do not include delivery fee. Ketchup & Mustard base topped with ground beef, pickles, onions, tomatoes, American and lite pizza cheese. One of our 8oz Prime burgers topped with our fresh made chili and cheddar cheese. Tomato Cream sauce with chopped sea scallops, applewood smoked bacon, lite cheese. Smoked Brisket grilled with sauerkraut, swiss cheese and Russian dressing. Comes with a side of either fries, chips, pasta salad, or coleslaw. Fresh Baby Spinach with Mushrooms, Fresh Garlic, Ricotta, Parmesan and Mozzarella cheeses. Served with our horseradish dipping sauce. 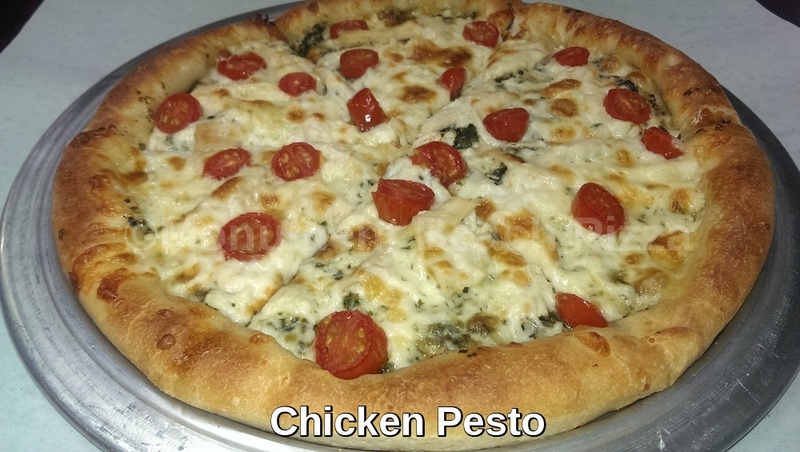 Fresh Pesto, Roasted Chicken, sliced cherub tomatoes and light cheese. With grilled tomatoes , onions, green peppers. Served with salsa and sour cream. Spinach, hard boiled eggs, apple wood bacon , walnuts, red onion and shredded Parmesan cheese. Served with our homemade honey Dijon vinaigrette dressing. Spicy Grilled Chicken with roasted red peppers lettuce and sour cream.